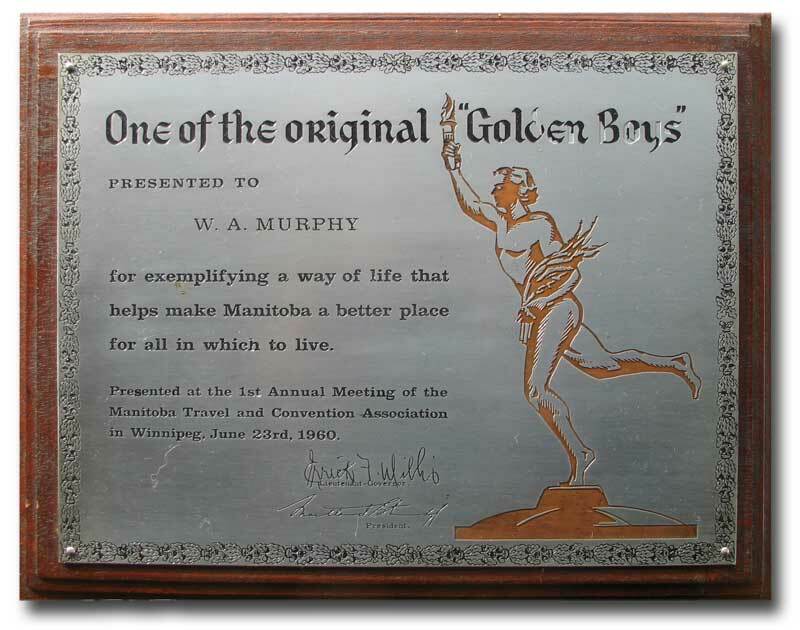 The award was initiated in 1959 by the Manitoba Travel and Convention Association (later merged with the Manitoba Tourist Association to form the Tourist and Convention Association of Manitoba, and still later renamed the Tourism Industry Association of Manitoba) to recognize Manitobans who had rendered meritorious service to their communities, based on nominations from the general public. The awards were renamed the Manitoba Good Citizenship Awards around 1970. Six to ten awards were presented annually at a formal ceremony with the Lieutenant-Governor of Manitoba. In addition, the association occasionally presented Certificates of Merit to worthy recipients. One of the first Golden Boy Awards made in 1960, in this case presented to W. A. Murphy. Source: Kitson Vincent, 2009 (photo by G. Goldsborough). “Twelve to receive Golden Boy Awards,” Winnipeg Free Press, 18 June 1960, page 1. “Eleven Manitobans and radio-TV station to be honored,” Winnipeg Free Press, 17 June 1961, page 52. “New Golden Boys,” Winnipeg Free Press, 12 May 1962, page 19. “Motorcade retraces trail of explorer La Verendrye,” Winnipeg Free Press, 9 September 1963, page 2. “Good citizenship awards to 8 for achievements,” Winnipeg Free Press, 9 November 1963, page 6. “9 Golden Boys and Golden Gal,” Winnipeg Free Press, 9 November 1964, page 1. “Golden Boys honor 12 Manitobans,” Winnipeg Free Press, 8 November 1965, page 1. “Citizen awards,” Winnipeg Free Press, 7 November 1966, page 1. “Manitobans honoured by Golden Boys,” Winnipeg Free Press, 6 November 1967, page 1. “10 Manitobans get Golden Boy Awards,” Winnipeg Free Press, 4 November 1968. “Travel group honors 6,” Winnipeg Free Press, 17 November 1969, page 1. “Six Manitobans to receive good citizenship awards,” Winnipeg Tribune, 18 November 1970. “Merged tourist groups to study economic angles,” Winnipeg Free Press, 19 November 1970, page 99. “Six receive Good Citizenship Awards,” Winnipeg Free Press, 30 October 1971. “6 to receive citizenship awards,” Winnipeg Free Press, 22 September 1972. “Good citizenship awards banquet,” Winnipeg Free Press, 27 October 1973. “6 Manitobans honored by tourist association,” Winnipeg Free Press, 8 November 1974. “6 receive citizenship awards,” Winnipeg Free Press, 29 September 1975. “Six named for citizenship awards,” Winnipeg Free Press, 11 February 1977. Photo, Winnipeg Free Press, 25 March 1978, page 9. “Six named ‘good citizens’,” Winnipeg Free Press, 22 January 1981, page 2. We thank Monica Ball of the Manitoba Legislative Library for her assistance in compiling this gallery. Additional information was provided by Vicki Wallace.